Records from Burg Hornberg date back to 1184 when it belonged to the burgraves of Lauffen. 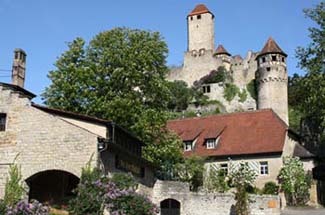 Knight extraordinaire Götz von Berlichingen bought Hornberg castle in 1517 from the bishop of Speyr and lived out his retirement here for 45 years. Never one to miss a battle, he sometimes went off for a round of adventure, and when he came home he spent his time dictating his memoirs to a priest. After his death, Götz’s grandson sold the property to Freiherren von Gemmingen, whose descendant owns and operates the castle hotel today. Even if you’re touring the Neckar Valley on a day excursion, try to stop by Burg Hornberg for a meal and enjoy the sweeping views of the river. The restaurant specializes in charcoal-grilled meats, and the wine from the castle’s vineyard is excellent. Rates include breakfast, tax, and service. Neckarzimmern is on the east bank of the Neckar River along route B-27. There’s a train station nearby. Yes. There is a castle chapel on the property. Not quite as famous as the Rhine, the Neckar River can hold its own with picturesque villages, quiet valleys, and splendid hilltop castles. Hornberg sits on an enviable position high above the river. The bulk of the castle lies in ruins; the hotel is incorporated in the Marstall, or former stables and the sheep’s barn. Comfortable and modernized, a certain medieval ambience still prevails with decorative touches such as coats of arms, open-beamed ceilings, and a suit of armor. Murals of medieval scenes give life to the walls. Original open fireplaces warm the rooms. Guest rooms bear names, not numbers. You can opt for the Arms’ Chamber, the Eagles’ Nest, and the Gunpowder Chamber. Some rooms have views of the Neckar.